National treasure Betty White is beloved by classic TV fans for her work in the sitcoms The Mary Tyler Moore Show, Golden Girls, and Hot in Cleveland. 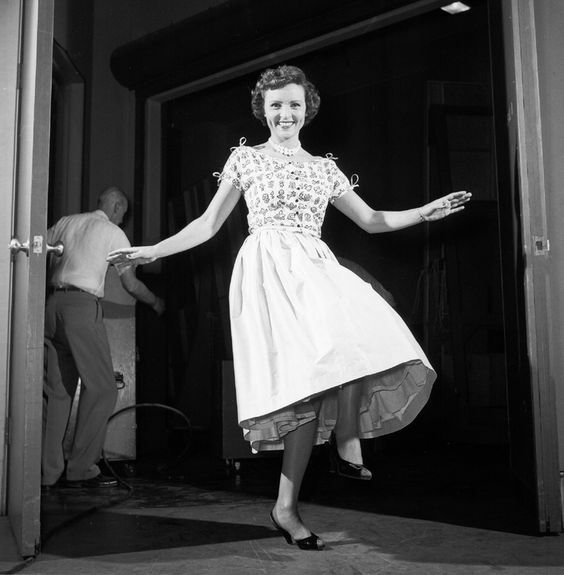 However, White, who will celebrate her 97th birthday on Thursday, got her start as the First Lady of Television on the fifties comedy Life with Elizabeth, which chronicled the daily activities of a Los Angeles couple. White was born on Jan. 17, 1922, in Oak Park, Ill., to Horace White, who worked in the lighting industry, and his wife, Christine. The young family moved to Los Angeles during the Great Depression and Betty, who enjoyed performing in school plays, nurtured a dream of becoming an operatic star on the big screen just like her idol, Jeanette MacDonald. White graduated from Beverly Hills High School in 1939, and got her first TV gig soon after in an experimental production of the operetta The Merry Widow (White played the same part as MacDonald in the 1934 film). However, White put her show business ambitions on hold at the start of World War II. She volunteered with the American Women's Voluntary Services, serving as a driver and courier who shuttled supplies to the defense posts along the Pacific Coast. 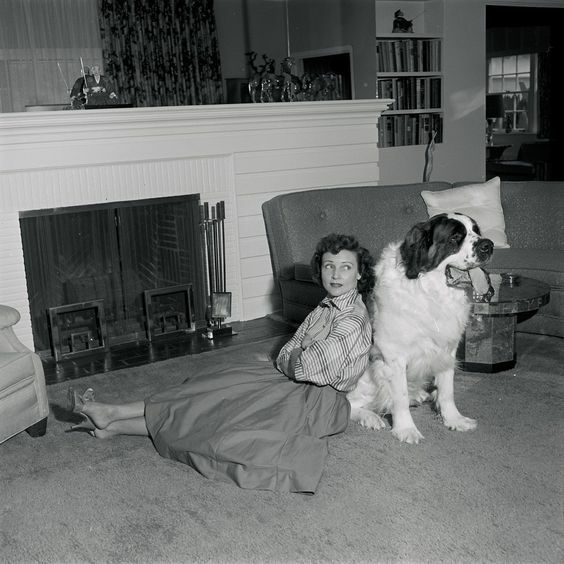 Betty White and her St. Bernard, Stormy, who appeared on Life with Elizabeth. When World War II ended, White re-entered show business. She got her break by saying "Parkay"* on the popular radio comedy The Great Gildersleeve. She began making regular appearances on Gildersleeve, which led to other work on radio and TV. Eventually, White landed a regular gig as a cohost of the popular talk show Hollywood on Television, which aired on the L.A. station KLAC for a whopping 5 1\2 hours each weekday. White and her cohost Al Jarvis filled all of that time by interviewing celebrities (silent movie legend Buster Keaton dropped by on one memorable afternoon), pitching sponsored products, chatting about current events, and doing person-on-the-street interviews (Jarvis and White would literally open the doors of the studio and nab whomever happened to be passing by). When Jarvis left Hollywood on Television in 1951, KLAC station manager Don Fedderson suggested that a half-hour sitcom featuring the characters of Alvin and Elizabeth would be a good way to fill the programming gaps that resulted from Jarvis' departure. Despite White's misgivings -- she didn't think a half-hour comedy show would work on TV -- she, Fedderson, and writer George Tibbles forged ahead, hiring talented radio personality Del Moore to play Alvin (classic movie fans know him as the university president in The Nutty Professor). 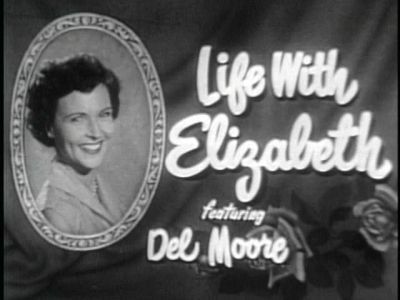 The first episodes of Life with Elizabeth, which were broadcast live on KLAC were a huge hit in Southern California, earning White the first of her many Emmy Awards. (In fact, the show became so popular that Moore was sometimes shouted at in public for "cheating" on Elizabeth when he went out on the town with his wife). Fedderson then decided to syndicate Life with Elizabeth to TV stations around the country+. White co-produced and starred in 65 syndicated episodes of Life with Elizabeth from 1953 to 1955, often while also working on other projects. White would sometimes film Life with Elizabeth all night and then immediately go to the set of her talk show, The Betty White Show, without any sleep. Twenty episodes of Life with Elizabeth are now available on the classic movie and TV streaming site, The Film Detective. I recently watched several episodes of Life With Elizabeth and this delightful program provides a fascinating glimpse into the early days of TV and the evolution of the sitcom. The series does not tell one half-hour story in the tradition of I Love Lucy/Our Miss Brooks; instead, there are three roughly 10-minute sketches -- referred to as "incidents" by narrator Jack Narz -- that relate the daily life of Alvin and Elizabeth (clip of the opening credits below). The incidents are mostly prosaic activities like reading the Sunday newspaper or changing a flat tire that are given a humorous twist by Alvin and Elizabeth's good-natured squabbling and Elizabeth's impish personality. The sketches usually ended with the narrator uttering the catchphrase "Elizabeth, aren't you ashamed" followed by White grinning and shaking her head no. All of the episodes in Life with Elizabeth make breezy viewing, but here are three incidents that I highly recommend. Alvin and Elizabeth host Alvin's work colleague (Robert Emlin) and his wife (Sharon Randall) for dinner, but, when Mrs. Underhill gets a little too flirty with Alvin, Elizabeth literally kicks her out of the house in a fine display of White's physical comedy skills. Anyone who's ever been confused by daylight savings time (raises hand) will be captivated by this sketch where an increasingly frantic Alvin and Elizabeth try to establish the right time so Alvin won't be late for work. This incident is funny, but it's also quite tense; if you're like me, you'll be counting the chimes of the church bells right along with the TV couple. This I Love Lucy-esque sketch finds Elizabeth trying to hide a black eye she got in a cooking accident from Alvin and a dinner guest (Robert Emlin). I'll leave you with this link to a clip of a self-deprecating White discussing Life with Elizabeth on the Pioneers of Television TV series. My sources for this article were Here We Go Again: My Life in Television by Betty White and the Pioneers of Television TV series. *Parkay is a margarine spread that was an ubiquitous part of American life in the 1940s. Parkay was throwing around the big bucks for corporate sponsorships and, according to White's memoirs, she probably would have never gotten another job on radio if she had messed up that one word. Despite having nightmares about saying "parfait" on air, White pulled off "Parkay" without a hitch. **The Saturday night show was a contest much like America's Got Talent or American Idol with the winning act getting to perform live on Hollywood on Television's daytime show. ***Ironically, White's given name is Betty. +The first episodes of Life with Elizabeth were filmed like a play in front of live studio audience. None of those episodes were recorded, so they were unavailable for future use. The later syndicated episodes were made in a studio and then shown to an audience to record the laugh track. These episodes were made for re-broadcast on TV stations throughout the U.S. and abroad. Thanks. I read about the show in one of Betty's books, but it was years ago and details start to disappear. I've seen some episodes of Date With the Angels, but not Life With Elizabeth. Your guidance will be helpful. It's a fun show to watch in little snippets, almost like you would watch YouTube videos today.